The external fixator is indicated for two biomechanically antithetic types of osteosynthesis — on the one hand; compression osteosynthesis, and on the other, gap osteosynthesis (Fig. 1) (Boltze et al, 1978; Hierholzer et al, 1978; Labitzke and Henze, 1978; Müller, 1981; Müller et al, 1979). In the first case, interfragmental compression can be applied because the area of bone contact permits axial loading. The compression stress, which is effective for longer periods according to the principle of a soft spring, guarantees increased interfragmental friction; it therefore also assures the stability of the external system (Fig. 1b) (Müller et al, 1979). In the second case, absence of contact between the bone fragments precludes compression (Fig. 1c, 2, 4, 5, 6). 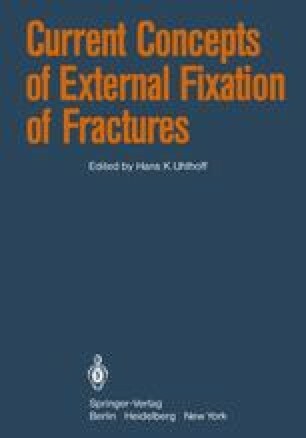 The stability achieved using an external fixator (ie, the state of relative nonmovement of the individual fragments with respect to each other) is therefore based solely on the outer stabilizing construction (Labitzke and Henze, 1978; Müller, 1981). In other words, external gap osteosynthesis is a fixation using an external supporter which absorbs externally applied forces. The stability of gap osteosynthesis relies exclusively on the rigidity of the external support.